Cross at the memorial for the victims. Taken April 21, 2007. 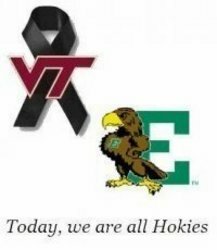 On April 24,several tribute posters for the VT community were placed around the Graduate Life Center. On April 19, people set up all kinds of memorials to mourn for the victims. Students of Virginia Tech encourage and comfort each other by writing the inspiring words.